Radio NewMR is conducting a series of interviews with key players from client-side insight functions to create a clearer picture of the changes that are taking place around the world. 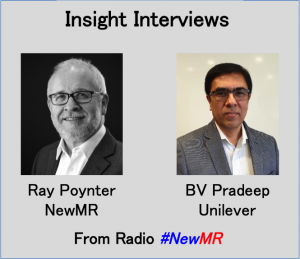 In this Radio #NewMR interview Ray Poynter chats with BV Pradeep who is Vice President, Consumer and Market Insight for Europe, North America & LATAM at Unilever and an established member of ESOMAR Council. To listen to or download the interview, click on the link below, or read the Ray’s notes from the interview. In terms of insights, Unilever has three broad groups. Partnering our key business leaders – focusing on converting insights into action to create business impacts. Centres of excellence – people looking to push boundaries and integrate new technologies. Back office – centralising and making more efficient the routine work of insights, experienced people using technology. Unilever also have teams at Global, Cluster and Divisional level. Change is not an event, it is an on-going process. The change at Unilever over the past five years is greater than the change over the previous twenty-five years. Digital is a major driver of change, we need to get digital thinking into the DNA of the insight function. Previously we handled digital by adapting offline methods to online, for example online surveys. But now we are need to pivot to embrace digital world. The challenge for Unilever insights is to double the impact at half the cost in half the time. Speed is a key issue and to meet the required speed it is important to remove manual process and put in automation, AI, real-time, and dashboards. Partners have been involved in these changes. The way Unilever does things like advertising testing, product testing and tracking is remarkably unrecognizable compared with what Unilever was doing five years ago. Unilever are also working with new partners, many of whom would not have previously been in the market research/insights field. The players have access to new and large forms of consumer data – allowing new outcomes to be achieved. Over the next two to five years the speed will get faster – as digital centres become the hubs for marketing. Unilever plan to connect to a billion consumers, which has massive implications for digital and AI to enable this target. This process is blurring the boundaries between marketing, insights, and commerce. Agencies need to realise the world has changed and their legacy model won’t come back. It is no use saying I used to collect X interviews and made Y amount of money and I would like to do that next year. The model has to change; things will be cheaper and faster. All agencies need to be tech savvy, all agencies need to have a data and tech competence. We will still need things like qualitative research, but they need to integrate and leverage technology. My current role in Unilever is Vice President of Consumer & Market Insight – Country & Customer Development for Americas & Europe. I am also responsible for three centres of excellence in Shopping & Ecom Insight, Market insight and Advanced Analytics. I am a member of the Global Unilever CMI leadership team. 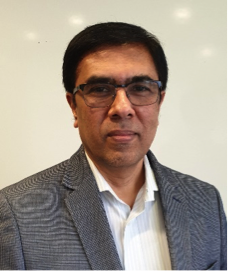 In my external professional circles, I was elected as the Vice President of the Global Market Research industry association, ESOMAR, for term 2017-18. I have been re-elected as Member of ESOMAR council for the term 2018-2020. I joined Unilever in June 1993, at Brooke Bond Lipton India ltd, leading market research & media. In Nov 1997, I was promoted as Head of Market research for Hindustan Lever ltd (HPC & Foods). In 2003, I was promoted as Vice President – CMI for Asia and later assigned to lead the BD CMI team for Home & Oral care categories. A year later, I was appointed as Global VP CMI for HPC categories, based in London. From 2009-2015, I was in Singapore as Vice President CMI for Global Markets, business partnering the Chief Operating Officer of Unilever. In 2017, after an organisational restructure, I was given leadership role to establish a new wing of CMI to support for Country & Customer development teams. Currently, I am an active lead in this role, to step change digital tools deployment for insights into action. I have been the key note speaker at American Marketing Association 2016, USA CRC conference 2016, TMRE 2016, ARF 2016, CEO Summit of insights association-London 2018, ESOMAR congress 2018, MRS of India 2016, Australia MR association 2018. I was Head of Market research, working for Titan ltd, in India, in the watches & premium Jewellery market. Prior to that, I worked for TVS-Suzuki motor company in India. I graduated in Mechanical engineering, with an MBA from the Indian Institute of Management, Bangalore. I graduated from IIMB with four gold medals in Marketing & Finance specialisation and also a strong passion for Consumer Insights and research, which has been my passion ever since. I am married with two children. My wife also works for Unilever in the area of Professional marketing for Global Oral care. My son is a computer science engineer in California. My daughter is a Graduate in Business administration and is working in New York. We have two lovely dogs. They are indeed the best creatures to de-stress us every day…. you really do not need a spa!! We enjoy family holidays at home or overseas! We’re able to offer the content we offer, because of our sponsors and our supporters. If you’d like to help ensure we continue to develop content, new ideas, and talent, then please become a Patron, via our Patreon page.